Kids love to seek and find (adults do, too!) and this gorgeous new book will take them on a tour of the globe, meeting animals in their natural habitat. But it's not just the band of animals they meet, living it up in the place they know best. 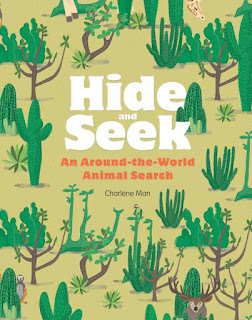 Each double-page spread, whether it be Emperor penguins in Antarctica or koalas in a thicket of gum trees, have a visiting animal that kids must find ... and each visiting animal is very far from home and really should not be there! A fun book with beautifully-designed pages and luscious illustration, my only gripe would be the occasional issue with text being too dark on the page, and therefore very difficult to see (why do some publishers do that!?). But this is otherwise a fabulous book of visual wonderment, perfectly succinct text, a sweet dose of humour, and ever, ever endearing ... animals. A relatively large-format book, with stunning matte paper and cover, this RRP is a bit of a bargain, too.